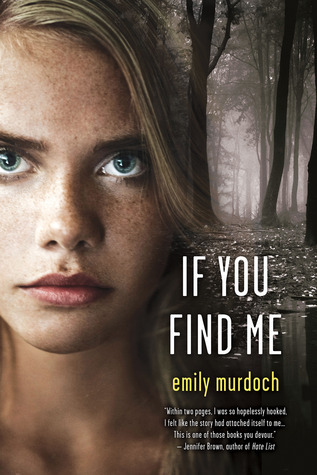 If you’ve read Chelsea Fine’s novel, Sophie and Carter, another great novel depicting children forced to grow up before their time in this cruel world, then you’re no stranger to having your feet knocked out from under you, and that’s exactly what Murdoch does to her readers in her fantastic novel, If You Find Me. Raw. Emotional. Gut wrenching. Triumphant. This novel pulled me in from the very first page and kept me up late into the night as I read, unable to put aside this beautiful novel that so captivated me. Carey’s story is one of heartbreak, gripping readers as the plot unfolds, all leading up to the night that everything changed for Carey and Jenessa. The prose, imagery, and characterization are absolutely phenomenal, and I am in awe of Murdoch’s writing style. Poignant and tragic, our heroine Carey steals the stage as her emotions overflow, unable to release the past, afraid of the future. Her life has been one of extreme hardship, caring for her little sister, Jenessa, and hoping to survive another day. This powerful novel is a must read for all lovers of YA; it’s emotionally overwhelming, but amazing all the same. Easily one of the best novels I’ve read this year. Five stars. St. Martin’s Press has been extremely gracious in allowing me to read an ARC of this novel, via Netgalley, prior to its release on March 26, 2013. I’ve been wanting to read this one for a while. The story sounds great. Every time I read a story involving young girls, I envision my daughter and it’s terrifying to imagine her in a situation like this. I hope I win and thanks for the tissue tip. In the past I read Suzanne’s Diary for Nicholas and was totally unprepared for the emotional impact it had on me. It’s definitely a great read! I haven’t read Suzanne’s Diary for Nicholas–I’ll have to check that out! Thanks! This sounds sad but good. I’m glad to hear it is a 5 star read. I’ve actually heard that a lot and hope to read it soon! OMG!! this book is just great! I’ve read nothing but good things about this one and I’m dying to get it. Thsi is what I call a powerful read. Loved your review too. i am still waiting for my book is coming..
the synopsys and reviews intrique me…. I am so very glad others are reading and loving IYFM. I’ve said it many times just this week, but the more I think on it, the more enchanted I am with the story. I admire Carey SO much, and the more I learn about Emily, the more i admire HER. Fabulous review, Shana – and thank you so very much for taking the time to read mine.